How you furnish and decorate your office space can have an effect on your clients so should never be taken lightly. Ideally your office space needs to present an image of trust, professionalism and above all a correct working environment to allow your staff and clients to get the best out of the relationship and environment. Making a good impression to clients is one of the key reasons to furnish your office space properly. Take a moment and try to see how your office looks to other people and then you may get a good idea of exactly how your office space can help or hinder your business. What may from a first glance look like a presentable working area may actually be a potential deal breaker to some clients, or alternatively could assist you in your business dreams. Not only do you need to take into consideration the way your actual office looks but you also need to consider how the building itself represents your company – Having a modern, well designed office in a run down building can be very off putting and detrimental. When planning your office space take a walk through to see what customers are faced with before and when they enter the building. The outside should be presentable, clean and make a good impression from the moment a client gets there. Inside a reception area needs to be free of clutter, efficient and have a welcoming and businesslike feel. Small things like a coat of paint can dramatically brighten up and alter a room to make positive changes. Choose the color scheme for your office carefully as it can mirror the type of work that you do and project a positive impact. Read about selecting colors for your office space using Feng Shui on Yahoo Voices. Ok so you have the color right but now you will need to think long and hard about the furniture in your office. Not only does it have to be comfortable for you and your staff to prevent problems such as eye strain and back pain – it also has to look professional, stand up well to daily use and keep that all essential good impression for your clients. Office furniture is not cheap but investing in bespoke furniture pays off. If you consider your company unique then your office space has to show it and by ordering custom furniture for your office you can incorporate your logo into the interior design and show off your corporate identity. Office storage will need to be addressed as clutter will most definitely give the wrong impression to clients and also look generally untidy. A correct filing system or storage cupboard will help to maintain that professional appearance and ensure your office is organized. Make sure you have an area that can be used for private meetings also. Lighting is important in any office as it enables you to work well and can also create the atmosphere necessary to inspire clients and staff. The balance between being too “institutional” or too dim is quite hard so being able to add or take away certain light sources can help. 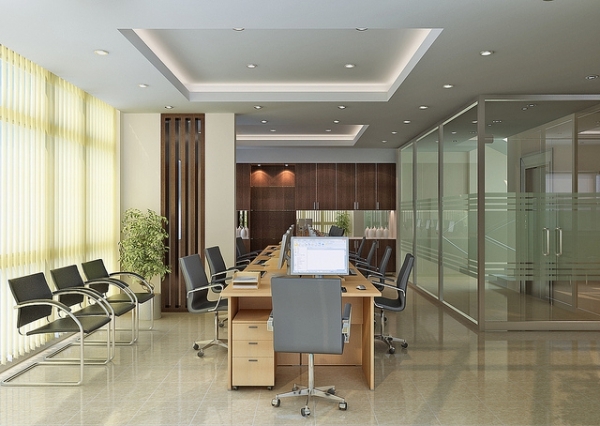 You want your office space to appear well lit but not harsh. More about optimal work space lighting you can read on Healthy Computing. Adding some accessories can help to find a professional feel without being overly personal. A nice painting or piece of art, a few plants or a well-designed company logo placed well can turn a drab office space into an interesting and vibrant office space.